Taking a minute to have a little fun! Sponsor BB Turman and Allyson Parker working on assembling our brakes! 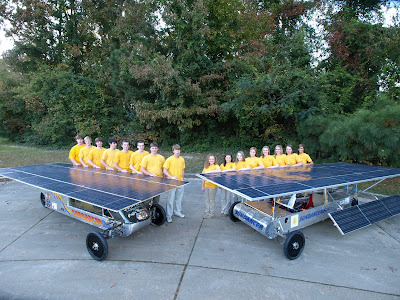 This past Monday we had our first solar car meeting for the month of October!! We had planned to take a new team picture before the meeting started, but due to rain we were unable to. We started the meeting with a quick update from our team captains Will Turman and Whitney George, and then we went into the lab to work on our cars!! We had a very successful night and see great potential in all of our new members!! Sundancer on Display in Jackson! The team unloading Sundancer and getting ready for a great day! We brought our trophies and helmets from the race to display! Mrs. Ellison guiding our newest team sponsor BB Turman! Could this be a future solar car member? 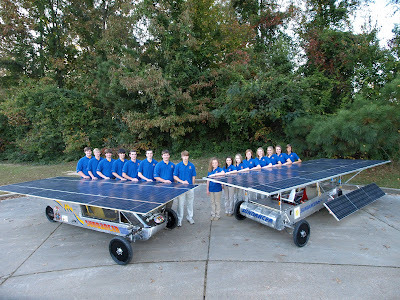 Friday, October 2, our solar car team was invited to Jackson to display our Open Division car, Sundancer at the Ag Museum! We met several students from various schools in Mississippi and enjoyed a great lunch provided by the Mississippi Development Authority. It was exciting to talk to the students , and answer their questions about the car and our team. It was a great opportunity and I hope we can come back next year!